It's been 25 years since the release of the genre-defining shoot em up R-Type, and a quarter century on the Evil Bydo Empire is nowhere near defeated! 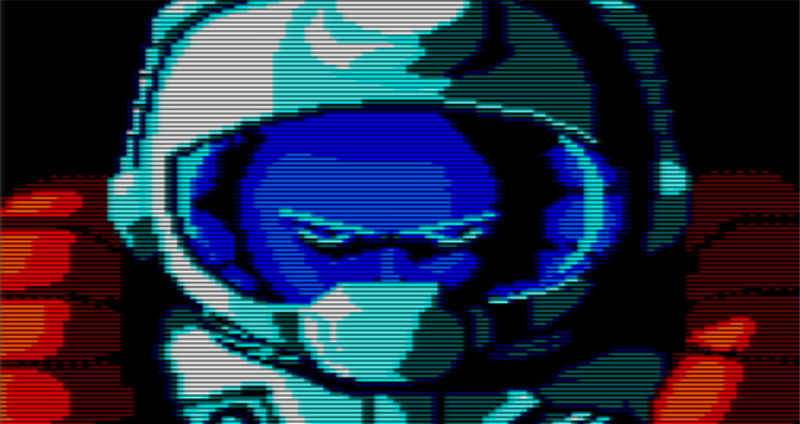 R-Type was ported over to the Amstrad CPC back in 1988, but that version (based on the Spectrum code) was more than a little lacklustre. Now, we've already seen one CPC port made over and rebuilt into something better this year (the brilliant Bubble Bobble For CPC) and this rebuild of R-Type certainly outshines the original CPC port of the game. A flashy intro kicks off R-Type 2012 (not its real title but since I'll be doing a bit of comparisons between the two games it's fit for purpose) and it's difficult to not make the decision that this is indeed an entirely superior remake just from this alone! A solid chiptune soundtrack underlines a palette of cool blues and blacks as the technical specifications of our R-9 fighter appear, and it's all looking very polished indeed. I imagine it's easy to storyboard a passable, bare bones intro for any game (correct me if I'm wrong!) with just a few explosions, a bit of action and, let's say, the title flying in from over the horizon then exploding, or something. In contrast, absolutely tons of work appears to have been put into this remake's intro, a slow buildup of tension leading to the big reveal of the title screen. I know I've banged on a lot about the intro just now, but it really sets the game off to a good start. It also sets a precedent, raising the bar for the action that follows. 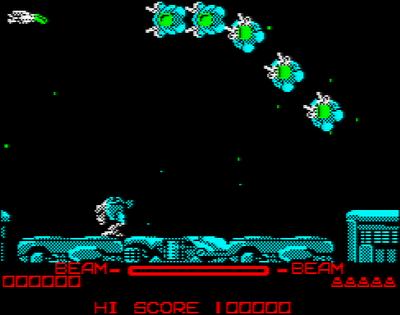 From takeoff it's clear that this is a faithful remake of R-Type, the level design is almost exactly the same as the original CPC port, but with bolder, bigger reworked graphics. Gameplay keeps up with the improved graphics as well. Bear in mind that the gulf of quality between the remake and original CPC port of Bubble Bubble that I mentioned earlier was huge, and this was partially to do with how shoddy the original was. In the case of R-Type the original material is already fairly decent, but the improvement is no less impressive. R-Type 2012 plays a lot faster than its older predecessor, and smoother too. I have to confess that I've always found R-Type a pretty hard game to play in any format, and managed to get further into the original than I did the remake. The structure of the game is pretty much unchanged; the attack waves all seem virtually identical to those in the original, with larger enemies taking the same number of hits to kill, and this attention to detail is commendable. The soundtrack also improves on the original; well, the original lacked background music so anything would be at least some kind of improvement, but the sound effects have been improved as well. 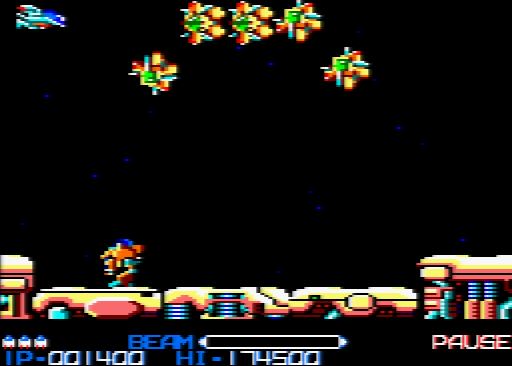 They were inarguably tinny back in 1988 and the remake pushes the CPC's sound chip fairly hard to deliver some pleasing sounds a world away from the percussive, trebly pops that signified explosions. This remake of R-Type matches the standards set by ports on other formats, and provides yet more bragging rights as to what the CPC can do. It has beaten the hell out of me several times, but that's just the way of R-Type. Download the game here (from the Easter Egg website). Thank you for all these compliments! Feel free to try the FULL EFFECTS mode (go to OPTIONS and set SOUND MODE). And please run it with Caprice32, sound emulation is really awful on WinAPE.